The Altimeter profile should be selected when your outdoor activity involves changes in altitude (e.g. hiking in hilly terrain). The Barometer profile should be selected when your outdoor activity does not involve changes in altitude (e.g. soccer, sailing, canoeing). To get correct readings, you need to match the profile to your activity. 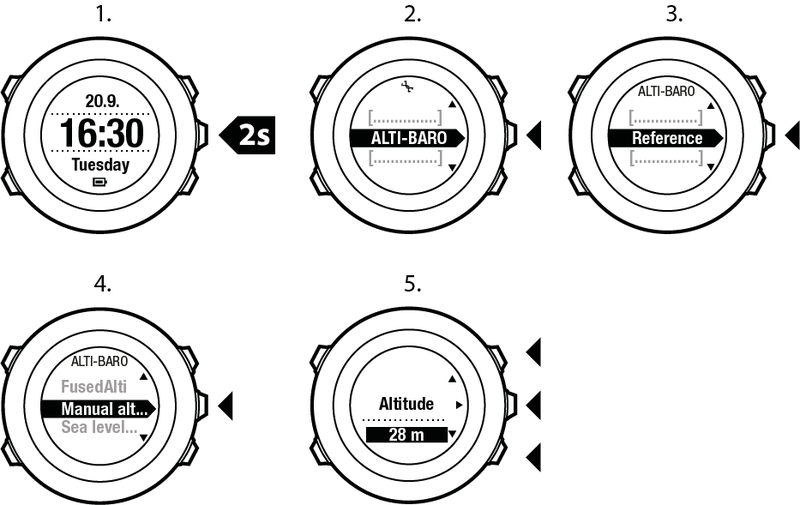 You can either let Suunto Ambit2 decide a suitable profile for the activity, or choose a profile yourself. You can define the profile as part of the sport mode settings in Movescount, or in your Suunto Ambit2. Press Next to select Profile. Scroll the profile options (Automatic, Altimeter, Barometer) with Start Stop or Light Lock. Select a profile with Next. FusedAlti: GPS is switched on and the device starts calculating altitude based on FusedAlti. For more information, see FusedAlti. Manual altitude: Set your altitude manually. Sea level pressure: Set the sea level pressure reference value manually. Set the reference value using Start Stop and Light Lock. Accept the setting with Next. You can access the Reference setting by keeping View pressed when in Alti & baro mode. You can also set your altitude during your exercise, see Setting altitude during exercise.